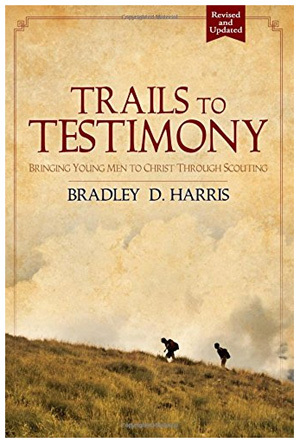 I’ve been looking for a route to help my boys knock out another ten miler for their Hiking merit badge. We had been up the North Canyon Trail to Rudy’s Flat on a recent backpacking trip when someone mentioned this trail’s connection with the Mueller Park Trail. I looked at some maps when I got home and discovered; 3.5 miles on the North Canyon Trail to Rudy’s plus 6.5 from Rudy’s to the Mueller Park Campground… Perfect! …we found our #3 of 5! These hikes aren’t really that difficult, they can just feel long at times. So to ensure the boys’ success on these long hikes, we look for ones that have a significant downhill advantage. That way, we can build up to harder hikes over time as they get older, stronger and more confident that they can reach the end and actually live to talk about it. We also used two cars for this one although it wasn’t required like our previous hike. If your only option is one car, you will have to pound 3 extra miles of pavement down Mueller Park Road, across Bountiful Boulevard and back up Canyon Creek Road to return to where you started. Other than that, watch for mountain bikers on this trail system since it is a very popular single-track route. You should also take the short diversion to Elephant Rock (aka “Big Rock”) to rest and catch the view (this is where we had lunch). It’s also about the half-way point on that Mueller side of this hike. Here’s a Google Earth file of the North Canyon to Mueller Park route with waypoints to help you navigate to this destination. 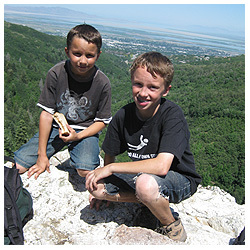 This entry was posted in Hiking, Wasatch Front and tagged 10 miler, big rock, bountiful, boy scouts, elephant rock, mueller park trail, north canyon trail, rudys flat, scout hike. Bookmark the permalink.